So, have you ever been planning a birthday party for your main man and wanted to add some decor, but were at a loss for something appropriate? Well, with just a few tools, a couple of ingredients and a few minutes of time, you too can whip together some decor that’s dude approved and dive bar suitable. Use a small saw to cut a .5 inch slit in the can (right below the lid). And then use tin snips or a strong pair of scissors to cut the lid off finishing the edge as smoothly as possible. Drop some rocks, sand or something with a little weight into the base of the can. You can fill it up about two thirds of the way. Then, top it off with potting soil or dirt from your own back yard. Leave a little bit of space at the top. Remove some of the excess dirt from your succulents by giving them a gentle shake. Pay special attention not to damage the roots as this will help give them life beyond your shindig. 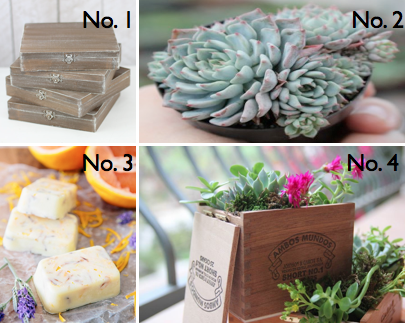 Arrange your succulents making sure to cover their roots with soil. I chose an assortment of shapes and sizes including one of my favorites, the string of pearls. I arranged 3 – 4 small varieties in a triangular shape and then tucked in the string of pearls so that they cascaded down the sides. Finish off with moss. 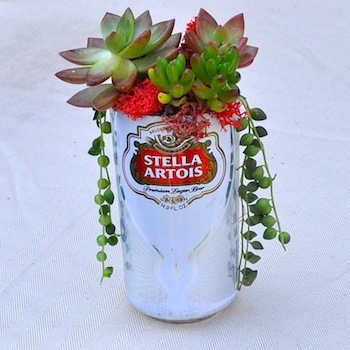 I chose a red variety to complement the red hues in the succulent and play up the label on the can. You can find a variety of shades including greens, browns and purples, so get creative! You can then arrange in clusters or display individually and I recommend that you maybe make a few extras as favors, because I’ve been doing florals and event decor for sometime now and this was the first time where the guys were the ones fighting over who got to take home the centerpieces! And while I used them to add some flair to my hubby’s birthday party at our local dive bar, I think they would be absolutely perfect for a casual backyard barbecue or ranch house rehearsal dinner. And the best part? This is one DIY project your guy might actually like!